Water is vital in a crisis, we'll need it for drinking, bathing, washing, bathroom essentials the list goes on. And its not always easy to store water- especially since we live in such a small place that we can't store big 30 gallon drums. So here is a tip and I love any tip I can get. and hopefully if your reading this you do too. SO here is the tip... ready? I learned this from my momma so I can't take the credit. 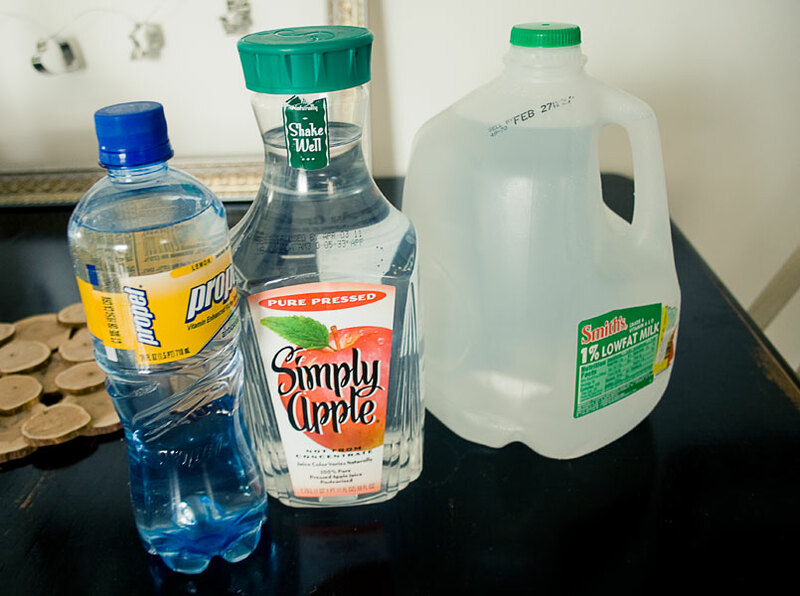 Do you throw out your old milk jugs, juice containers or water bottles?? DON'T! Its as easy as washing out the container, filling them back up with water and storing them anywhere they will fit. They are easy to store anywhere and will be really nice to have if you ever need water. EXAMPLE: So my mother wasn't in a huge crisis when she needed water containers- their water pipes froze in their house which meant NO WATER. She knew if she got her 30 gallon drum out it wouldn't be easy so she pulled out her water bottles. LESSON LEARNED: When you do have a faucet you don't realize how hard it is to do a simple things such as wash your hands because you don't have both hands. So to be able to whip out small water bottles to do the little things are very helpful. So, even if you do store big Gallon drums, or don't have any it never hurts to have extra water on hand. Especially when you can store them anywhere- like... (don't judge) under you bed, coat closet, cupboards, etc. HELPFUL? I hope so, or else I just look like a raving luny. *Disclaimer* milk jugs cannot be used for drinking! But could be used for toilet water.... only clear containers can be used for drinking. Great post and in the wake of Japan I think this is very good to bring attention to. We live in an apt so the big drums won't work. We love the water containers mentioned. And its a great way to cut down on waste as well. ps- I love that Simply Apply Juice! Hey Raving Luny- THaNKS for the tip!! I need to be better at this so Thank You for the reminder. Jelly- you can add bleach to the water- its quite inexpensive for how far it will go. OR what I do is just empty them out every year around the same time and fill them back up again. That way its still fresh water. Hope that helps! Nope not a raving looney, lol. I love reusing all kinds of things, so this is right up my alley girl.